In 2015 we developed our town information boards project, aiming to encourage visitors to “Walk Cromer” and to use some of our excellent public transport links. Cromer is the hub for access to a superb range of footpaths and National Trails, as well as many more local walking routes. We are delighted that many local traders & accommodation providers are displaying our window stickers, encouraging walkers to stay, shop, take tea, or enjoy a delicious pint, muddy boots & all! North Norfolk Information Centre staff have been a great asset, offering help & advice, displaying our banner & selling our cute little Cromer­-Sheringham Pocket Walk & information packs. We are adding more walks to this series, and each will contain discount vouchers for use in local shops & businesses. Our first Discount voucher is in partnership with Mountain Warehouse, offering 10% off on presentation of the discount card. We are looking for more businesses to add vouchers to the packs, the scheme is free to enter and should encourage more customers through your door. Space is limited, so get your application in as soon as possible. 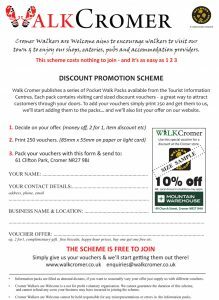 Our Pocket Walk Packs are available from the North Norfolk Information Centre and cost only £1, they include the Mountain Warehouse Discount card…. It’s a no­brainer!